Below is a list of restaurants/ bars/ establishments that we fondly refer to as sisters. They are, in some way, proudly related to us here at Clyde Common; whether it be through ownership, close association or long-time partnerships. Pepe le Moko is a 36-seat basement bar, nestled up beneath the bustling hub of Clyde Common. In the center of a 16-foot zinc bar, a bartender stands in spotlight, encircled by dimly lit banquette and booth seating. The ship-like, coved ceiling helps create an easy intimacy — a bit of smooth polish in contrast to the original distressed concrete walls. We play Ellington, Basie and Lester Young — their full, round sounds roll along the coves in a musical embrace that makes the space feel whole. Risqué vintage polaroids hang on the rough wall to remind you why you are drinking in the first place. Salumist Elias Cairo, grew up first generation Greek-American with a father who made charcuterie at home. Doing things the old-fashioned way was commonplace. Elias later journeyed to Europe to apprentice in the kitchens of masters. It was there that he rediscovered the art of curing meat and found inspiration in the markets and mountain towns of the old world. Back in beautiful Portland, Oregon, Elias set out to approach the craft of charcuterie with purity and patience, recreating a nearly extinct traditional technique that is seldom seen in America. The result is Olympia Provisions, Oregon’s first USDA-approved salumeria, established in 2009, deeply rooted in the past. Bar Casa Vale is a cozy, wood-fired, Spanish inspired bar and restaurant. We celebrate the bounty of the Pacific Northwest through the lens of Tapas bars in Barcelona, Sherry bodegas in Jerez, and Pintxo crawls through San Sebastian. We love to pour gin tonics the true Spanish way, and Jamon Iberico de Bellota slicing as it should be! You will find only the freshest seafood from the Pacific Ocean, meats from the pasture lands surrounding Portland, and vegetables grown on the farms located just down the street. Our motto is simple: Cooking the perfect ingredient over hard wood creates the best tasting food. Join us seven nights a week at our bar, dining room, or beautiful outdoor courtyard. Whether March Madness or the Super Bowl, Spirit of 77 is one of the hippest spots in town. With an expansive beer-hall setup filled with tongue-in-cheek retro touches, it comes with large, flat-screen TVs; a projection screen; and pop-a-shot basketball. The food is a cut above, too, touting responsibly sourced chicken for its wings and beef for its burgers. The transformation is complete at SE Division's former Matchbox Lounge space: Olympic Provisions/Clyde Common mastermind Nate Tilden and longtime Clyde GM Nick Gusikoffdebuted their British-pub-meets-Restaurant-Row watering hole, the Richmond Bar, located a stone's throw from Pok Pok and Ava Gene's. The space combines some familiar PDX-bar aesthetics (hand-worked steel and leather bar stools, wood tabletops) with tufted booths, white tile, and an eye-popping wallpaper sourced from the UK's Select Wallpaper. Coffee is about pleasure. It’s that moment when your hand is warmed by the mug, you raise it to your nose, inhale deeply and then take a sip. That sip is the culmination of years of work, three-thousand mile journeys, and passion. That sip is Stumptown. Ace Hotel Portland is in the old Clyde Hotel building in Downtown Portland. We’re a block from Powell's Books, a block from the Pearl District and an easy stroll to just about everywhere else. Portland takes public transportation pretty seriously — you can hop a train or a bus and get most places across the river in no time at all. There are lots of bike lanes, so you can borrow one of our bikes or rent the beautiful handmade bikes that Jordan Hufnagel made just for us. Clyde Common is a great restaurant next door to the lobby with one of the best damn bars in the country. Really. Everybody says so. There’s a Stumptown Coffee, too, because in the Pacific Northwest you need good coffee. 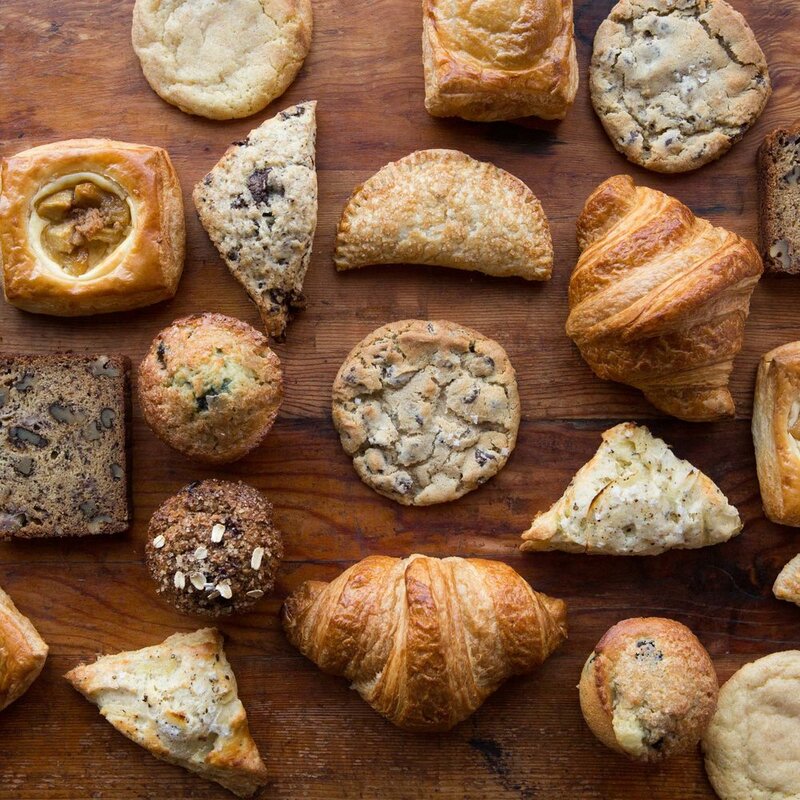 Born from a love of the perfect croissant, and a desire to craft everything under one roof, Rushmore Baking is a new company from Pastry Chef Kristen Napoleoni, General Manager Brian McCaul and Restaurateur Nate Tilden.